Seasonal Flower Arranging Workshop #1 - "Stylish Spring"
Flower Arrangers´ Feedback "Thank u 4 going thru all the hassles of sending to to me in Australia! Much appreciated! ", "A1 seller & item +++++++++++++++" "great fast delivery beautiful little book" "Fabulous book arrived quickly and perfectly packaged"
As a prolific designer Gill thought it would be exciting to design a range of living vases, screens and structures, using fresh foliage, which are either in water or in water retaining materials that can be used to display and enhance contemporary floral designs. Gill spent a year designing and developing her new range of living vases, screens and structures; some of which she has already taught in selected workshops. As the majority of the foliage selected is evergreen, the vases, screens and structures very often out live the flowers! The reader is provided with instructions in both written narrative and pictorial stages of development, using over 160 photographs, of how to make each living vase, screen or structure for both floral designers and florists. 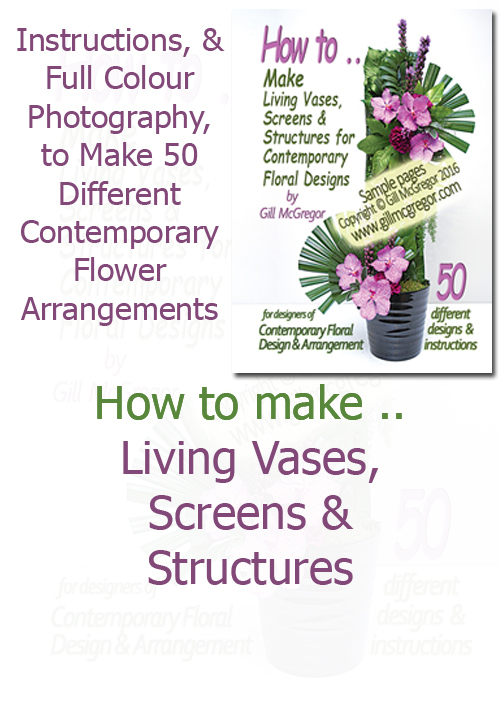 Gill thoroughly enjoyed making this book as she was able to specialise in how to use foliage in floral design to create distinction and wishes you as much pleasure when reading through this new flower arranging book. As a prolific designer Gill thought it would be exciting to design a range of living vases, screens and structures, using fresh foliage, which are either in water or in water retaining materials that can be used to display and enhance contemporary floral designs. Gill spent a year designing and developing her new range of living vases, screens and structures; some of which she has already taught in selected workshops. As the majority of the foliage selected is evergreen, the vases, screens and structures very often out live the flowers! 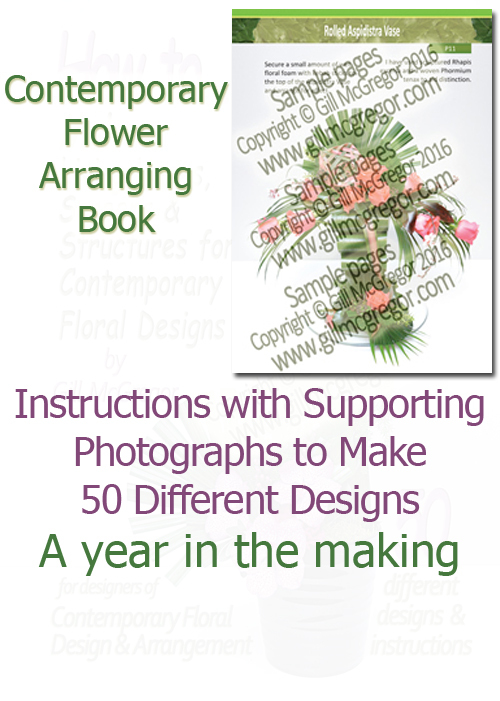 The reader is provided with instructions in both written narrative and pictorial stages of development, using over 160 photographs, of how to make each living vase, screen or structure for both floral designers and florists. 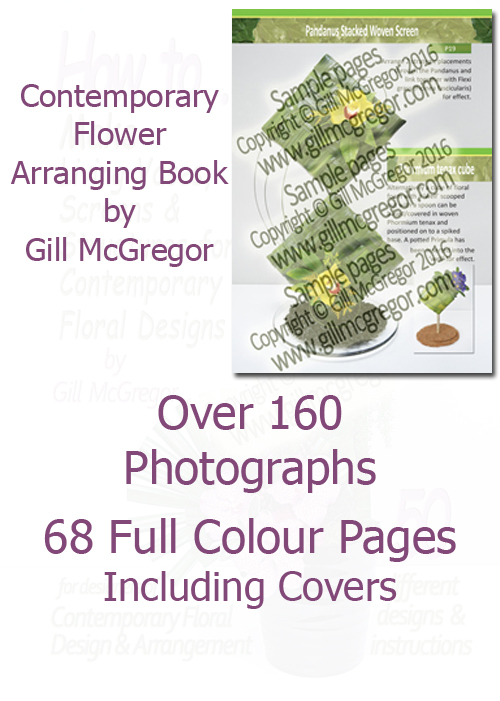 Gill thoroughly enjoyed making this book as she was able to specialise in how to use foliage in floral design to create distinction and wishes you as much pleasure when reading through this new flower arranging book. 68pages including covers & index with Full colour photography and supporting text. As a NAFAS National Flower Arranging Teacher, a Qualified Floristry Teacher and NAFAS Flower Arranging Demonstrator, Gill McGregor has specialised in Contemporary Floral Design and knows how important it is to include Contemporary techniques within floral designs to create Floral Designs with distinction - €11.99 + Untracked postage to the Republic of Ireland - other country's postage varies. 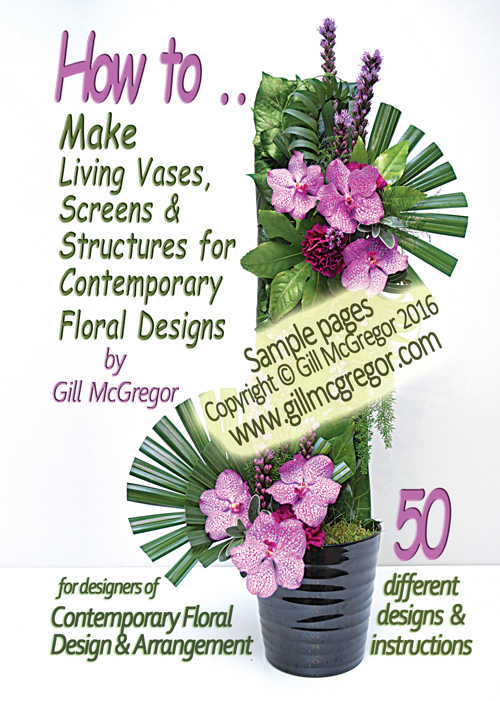 "How to Make Living Vases, Screens and Structures for Contemporary Floral Designs". ISBN 978-0-9929332-3-4. Full colour photography and supporting text, A5 portrait, 68 pages including covers. Untracked: (Airmail) where the package is sent without tracking or signing, and no compensation for non delivery. This service is the lowest cost option and has 100% success, so far, for book delivery around the world. Typical 4 to 7 days - the longest was to South Africa - 32 days! Is normal. For greater peace of mind you can upgrade the postal service to include Tracking and/or Signing. Which service is available depends on your local postal service options. If you live outside of the UK, your government may ask you to pay them additional tax - sales tax, duty. In the UK the duty for books is zero rated. We send books through Royal Mail and they then through your local postal service. 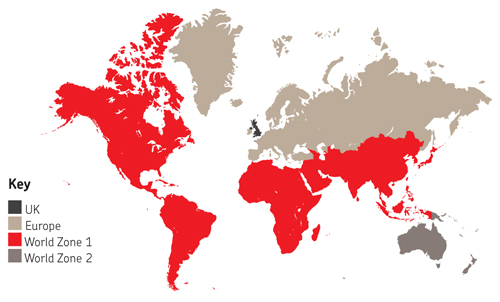 For prices, the Royal Mail postal service breaks the world into 4 different Zones. Can we send books to you in your area and how much? If we haven't already listed it, then send your request for more information to books@gillmcgregor.com and we will let you know what you need to do and how much it will cost. Gill has performed 100s of Floral Art demonstrations and entertained 1000s of club members at NAFAS Flower Clubs in the London and Overseas, Home Counties, East of England, Kent, BBO and Surrey Areas. A Flower arranger since the age of 11, Gill was on the adult flower arrangers, competitor’s circuit at the age of 14; winning a host of different competitions and awards. At 16 Gill performed her first Floral Art demonstration and became a qualified NAFAS Flower Arranging demonstrator in 1992. As a fully qualified Flower Arranger Gill has taught Traditional Flower Arranging and Contemporary Floral Art classes and workshops; receiving hosts of compliments for their course content and her teaching delivery. For many years Gill was a Floral Art scheme adviser for City and Guilds and wrote the current suite of C&G Level 1-3 Flower Arranging qualifications. Flower Arranging has always been Gill’s passion and she continually strives to design and develop new Floral Art Techniques and Designs for the Floral Art World. Gill McGregor NDSF is a fully qualified florist holding the Society of Floristry NDSF Diploma, equivalent to the current Level 5 C&G Floristry qualification, a fully qualified Further Education (FE) teacher and the holder of the Certificate of Education. Gill's expertise for developing courses is achieved through her vast experiences; in the management of thriving retail floristry businesses in London for 12 years, running a floral and balloon decorating business specialising in wedding designs and decor and participating in wedding fashion shows. As Gill’s passion and enthusiasm for teaching developed Gill successfully grew and headed up an OFSTED Grade 1 Floristry department in a specialist FE College for many years. Heavily involved in the promotion of the Florist industry Gill participated in the writing of City and Guilds Floristry qualifications for over 20 years and has demonstrated Floristry skills and techniques at eminent Floristry shows in the UK, Essen, Paris and Kansas. Gill received the prestigious City and Guilds silver medal (highest accolade) for her achievement in the Level 4 Floristry Business Procedures qualification in the UK. Over the years Gill has taught 100s of Floristry students with many running successful businesses in London and the Home Counties. Courses run in idyllic local settings which include character hotels and approved facilities in the Hertfordshire - London ⁄ Middlesex, Cheshunt, Goffs Oak and Waltham Abbey; dependent on anticipated course delegate numbers. Refreshments are provided.